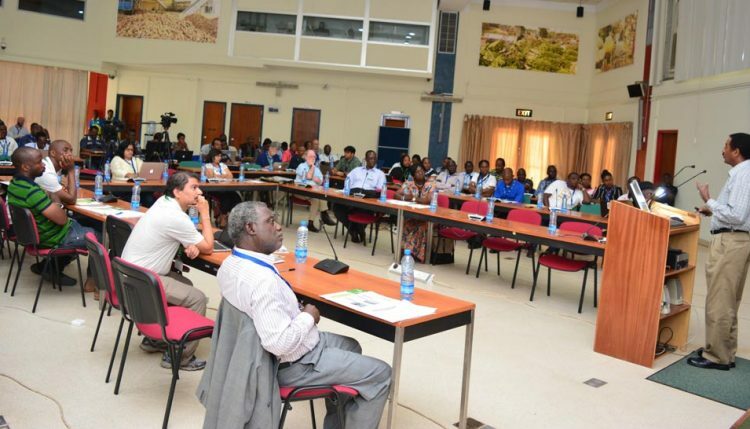 As part of the 50th anniversary celebration, IITA had mounted a one-day symposium tagged as “Breeding for the Grand Challenges”. 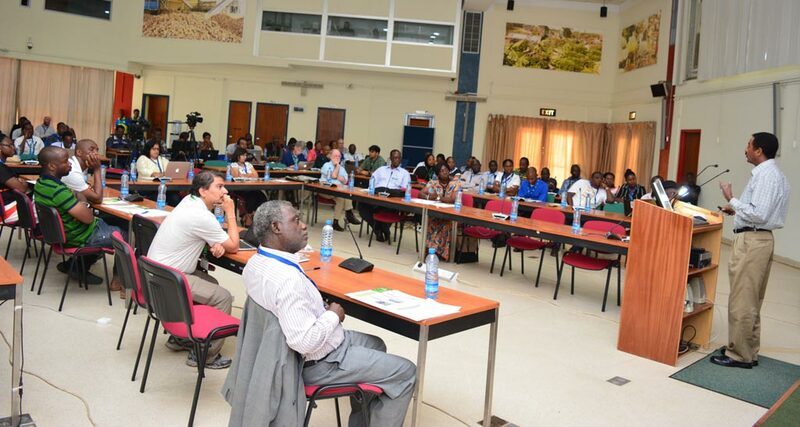 This full-house event was held on 11 April at IITA, Ibadan, Nigeria, and attended by more than 200 collaborators from the national agricultural research system, including advanced research institutions and various universities, and private sector partners working on crop improvement. IITA’s Abebe Menkir addressing the workshop attendees in Ibadan. The meeting was organized by Robert Asiedu, Director for the Western Africa Hub, and Michael Abberton, Head, IITA Genetic Resources Center. According to Abberton, the meeting was timely for three reasons. “Firstly, the 50th anniversary of IITA provided a good opportunity to take stock of past achievements…But the main purpose of the meeting was to build on this progress to move forwards. Therefore, a second reason is the recent advances in biotechnology that bring with them the chance to make faster gains in breeding. Thirdly, it has become increasingly obvious that this acceleration is indeed necessary if we are to achieve food security for Africa in the face of climate change by 2050,” Abberton explained. Most of the presentations focused on two key themes: Firstly, that breeding of African staple crops must focus on quality including micronutrient composition as well as disease, pest resistance, etc. Secondly, that both classical and modern techniques can make significant progress in this regard and that the use of transgenic technology or the new and exciting genome editing methods are complementary to classical breeding and require it to reach fruition in new varieties with real impact. Topics and speakers include: Policy and regulatory issues for GMO and new breeding techniques, Dennis Eriksson, Swedish University of Agricultural Sciences; Current status and future prospects of breeding cassava for micronutrients, Elizabeth Parkes, IITA; Breeding maize for micronutrient enrichment, Abebe Menkir, IITA; Role of genetic engineering in crop improvement, Leena Tripathi, IITA; Bananas: new traits into old cultivars by genetic modification, James Dale, Queensland University of Technology; Capacity building for plant breeding in West Africa, Malachy Akoroda, University of Ibadan; Breeding to transform cassava, Eugene Terry, CGIAR Systems Management Board, West Africa Center for Crop Improvement (WACCI), and @BecA-ILRI; Advancing plant breeding education in sub-Saharan Africa: Successes and challenges, Eric Danquah, WACCI; and Consortium approach to develop and deploy sorghum enriched with vitamin A, iron and zinc for farmers in Africa: The case of African Biofortified Sorghum, Michael Njuguna, Africa Harvest. A dialogue between/among scientists working on different avenues of crop improvement is necessary to maximize gains. Approaches are synergistic and complementary only when awareness is high and communication is good. The regulatory environment for transgenic and editing technologies will be a key factor determining whether they are successfully implemented. For editing this is uncertain globally. For both there is need for greater engagement of scientists with regulatory agencies, policy makers, politicians, and of course farmers and consumers. The challenge is to increase the rate of progress in crop improvement. A major focus of the day was how to equip the next generation of plant breeders to bring together old and new tools to achieve this.